Beelzebufo ampinga, so named for the ancient deity often called the “Lord of the Flies,” was a devilish frog indeed. The species, which lived on the island of Madagascar around 70 million years ago, was likely the biggest frog that ever hopped about the Earth (National Geographic describes it, delightfully, as “beach-ball-size”). And according to new research on its modern cousins published in Scientific Reports, Beelzebufo ampinga may have had jaws powerful enough to obliterate small dinosaurs. Most of us in North America think of frogs as floppy, relatively fragile lil bubs who snack on flies and other diminutive critters. But a frog that chews on more formidable prey isn’t as wild as it might sound: Even today, a few species—like bullfrogs—are infamous for eating just about anything they can cram into their mouths (including, but not limited to, birds and rodents). So when scientists first described this hellish ancient amphibian in 2008, they speculated that its gaping maw might have allowed it to eat fairly large vertebrates. Now, almost a decade later, scientists have new proof of its hunting prowess: By calculating the jaw force of one of the frog’s modern relatives, they say, they’ve managed to estimate how much power Beelzebufo ampinga would have packed in a crunch. Modern South American horn frogs (Ceratophrys) seem to share a lot of physiological similarities with Beelzeblurb; their mouths are so large they’re often called “Pacman frogs.” The researchers found that even tiny horned frogs—with heads less than 5 centimeters across—have bite forces of 30 Newtons, or around 6.6 pounds. Humans, in case you’re wondering, can inflict a bite force of something like 1,300 Newtons with our strongest teeth (the second molars). But we’re, uh, slightly bigger. When all other mechanical aspects are equal, size equals more power. That’s why the scientists behind the new study estimate that larger horn frogs (ones with heads about 10 cm across) likely have a bite force of almost 500 Newtons. The study authors liken that to the pressure you’d feel balancing 13 gallons of water on a single fingertip. It comes dangerously close to the force of the common snapping turtle, which has been measured at 657 Newtons and can slice your dang fingers right off. When you bump up the scale to match the size of Beelzebufo ampinga fossils, the estimated bite force shoots up to 2,200 Newtons—which is comparable to what you see in predators like lions. “At this bite force, Beelzebufo would have been capable of subduing the small and juvenile dinosaurs that shared its environment,” study author Marc Jones, researcher at the University of Adelaide’s School of Biological Sciences and honorary researcher at the South Australian Museum, said in a statement. Of course, Jones and his colleagues note in the study, they don’t actually have a Beelzebufo hopping around to snap bird bones apart in the lab. 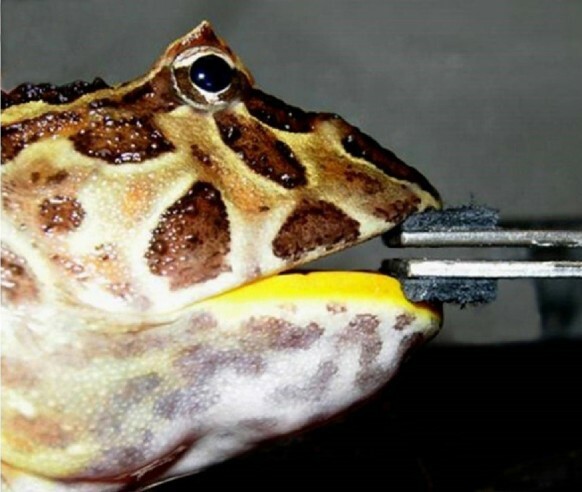 They did directly measure the bite force of a small horn frog—the first such experiment on any frog, the researchers say—by having it bite a specially designed force transducer that “encourages high-effort biting and avoids damage to teeth and bones.” And they know that the jaws of little horn frogs and big horn frogs are mechanically similar, so they’re pretty confident, they say, in their ability to scale up bite force for the larger living amphibians. But Beelzebufo isn’t so easy. But, they add, it’s just as possible that the head width they used in their estimates isn’t actually the maximum size for the species. Maybe they’re calculating bite force based on a runt of the devil frog litter. In that case, munching on young crocodiles and dinosaurs would have been a snap.